This salad makes the perfect side dish to any summer grilling session. 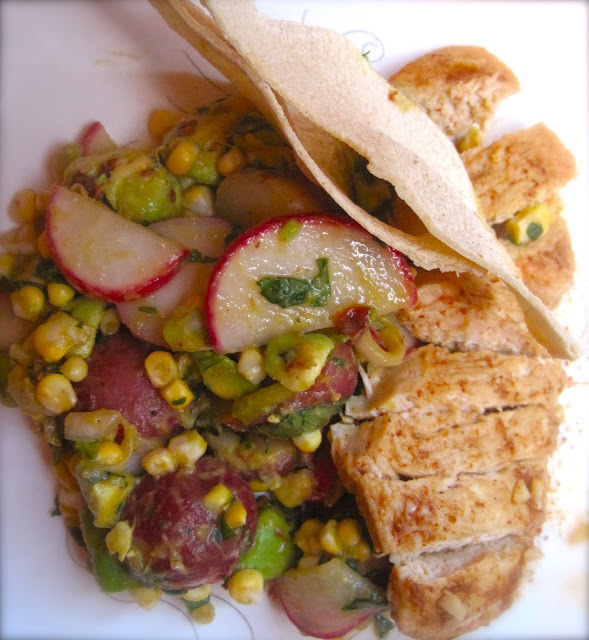 The smoky and spicy Corn, Avocado and Red Potato Salad pairs wonderfully with any Southwestern-rubbed grilled meat, whether steak, chicken or salmon. Couple together in a warm flour tortilla, and this dish is complete. Corn and baby red potatoes are the foundation for this salad, but its flavors boast so much more. Avocado, cilantro, and lime juice add the Southwestern flare, and a minced adobe chile-an essential to this salad- contribute a delightful smoky taste. Radishes, an unexpected but welcomed ingredient, bring a nice crunch to the soft potatoes and its own spicy kick to the dish. Toss together lime juice, honey, extra virgin olive oil, cumin, chili powder, and salt & pepper for an easy Southwestern grilling rub. For more ideas, check out BHG's awesome spice rubs or Epicurious' Fire it Up Guide. Vegetarian? Add some black beans and baby spinach leaves for the ultimate filling summer salad. Serve with toasted tortillas, crumbled on top. 1. In a medium saucepan, cover potatoes with lightly salted water. Bring to boiling over high heat. Reduce heat to medium and cook potatoes until tender when pierced with the tip of a knife, about 20 minutes. Drain, rinse under cold water, and drain again. Cut each potato in half, transfer to a medium bowl, and refrigerate to cool. 2. Cook corn (preheat gas or charcoal grill to 450 or 500 degrees directly over coals or burners with the lid closed as much as possible, until the kernels are brown in spots all over, 8 to 10 minutes. Alternatively, roast corn in the oven in husks to preserve moisture at 350 degrees for 30 minutes.) When corn is cool enough to handle, cut kernels from cobs. 3. Add corn to the bowl with the potatoes along with the avocado, radishes, scallions, and cilantro. 4. In a small bowl whisk together lime juice, minced chile pepper, and garlic. Gradually whisk in the oil. Pour over the potato mixture and toss to combine. Season with salt and pepper.